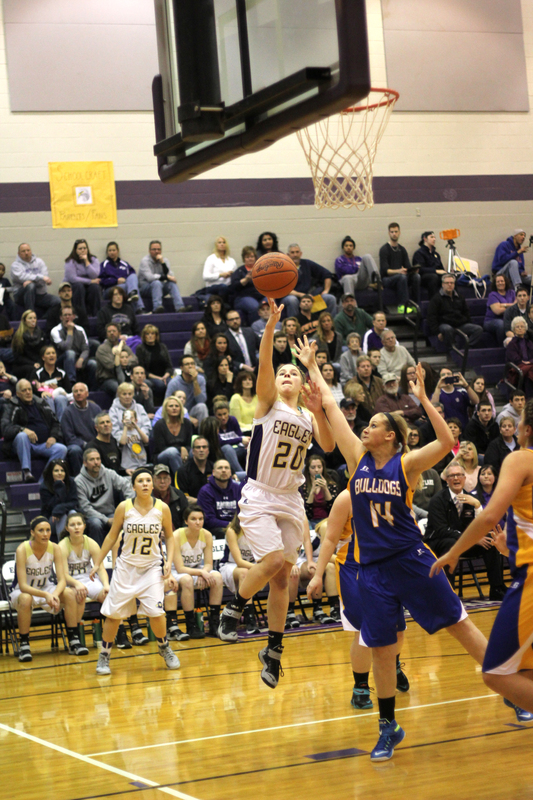 Senior Emma Herr scores two of her five points during Schoolcraft’s March 6 district win over Centreville. SCHOOLCRAFT – A smothering full-court press caught an overwhelmed and careless Centreville squad off guard, as the Schoolcraft girls’ varsity basketball team snagged a district title Friday. Before a raucous home crowd in their packed gymnasium, the Eagles rolled over the Bulldogs, 44-32. Buoyed by a fast start and a 14-3 lead after the first quarter, Schoolcraft coasted the remaining 24 minutes to seal the win and even its season record at 11-11. A much stiffer challenge awaits in Class C regional action, as the Eagles take on state-ranked Niles Brandywine. The 21-1 Bobcats host the 5:30 p.m. contest Tuesday. Nonetheless, the Eagles have bragging rights in a district that included a win earlier in the week over White Pigeon. Centreville entered the contest with a 13-9 record and had in attendance more than 60 students who crammed into a spectator bus and were poised to celebrate the Bulldogs’ first district crown since 1998. Schoolcraft, however, capitalized on Centreville’s miscues; the Bulldogs turned over the ball in eight of their first nine possessions. Small was quick to praise freshmen Kennedy Leighton and Lydia Goble, who combined for 17 points. He said the youngsters showed incredible poise in an intense situation. Leighton, in fact, was the team’s leading scorer, with 13 points. The Eagles were up by seven before Centreville finally got on the scoreboard with less than three minutes to play in the quarter. The 11-point cushion after the first quarter was maintained almost throughout the balance of the game, as Centreville managed to cut it to nine twice in the fourth quarter. Just when the Bulldogs started to gain momentum, however, Schoolcraft responded immediately: Goble nailed a three-pointer early in the fourth quarter to give the Eagles their largest lead of the night, at 17, and Leighton drained a pair of free throws near the two-minute mark to snap an 8-0 run by the Bulldogs. Hunter Hart, a senior, prepares to block an in-bound pass during Schoolcraft’s March 6 district title game against Centreville. 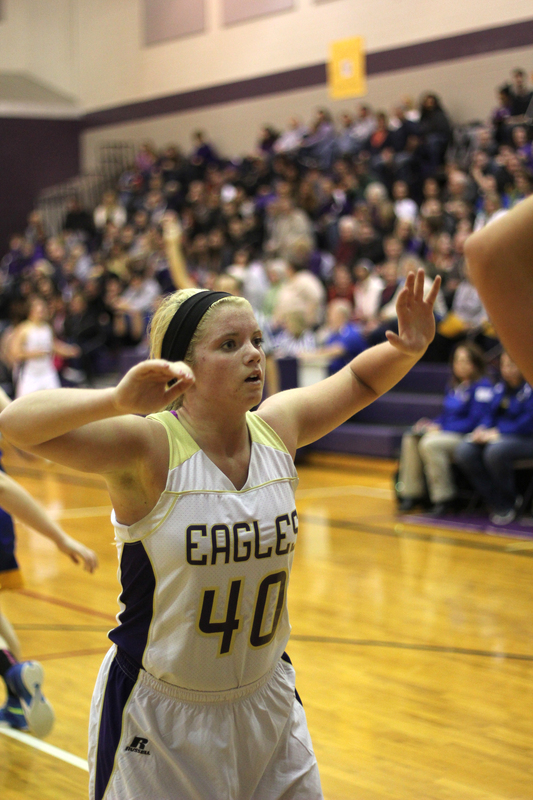 Small said Schoolcraft had its flaws – foul troubles and free-throw shooting, specifically. But the Eagles persevered and benefitted from a total of 23 Centreville turnovers. He said his counterpart, Jill Peterson, did a commendable job making adjustments to counter Schoolcraft’s full-court press. In addition to Leighton’s 13 points, Taegan Block had 10, Wynn Stitt contributed six, Emma Herr added five, Amber Overley and Goble had four points each and Sara Wisser scored two. Small said his squad deserves credit for coming alive in the postseason and playing with a level of intensity that proved the district title was no fluke. “They’re playing harder, but we’re going to have our hands full against Brandywine … we all realize that,” Small said. 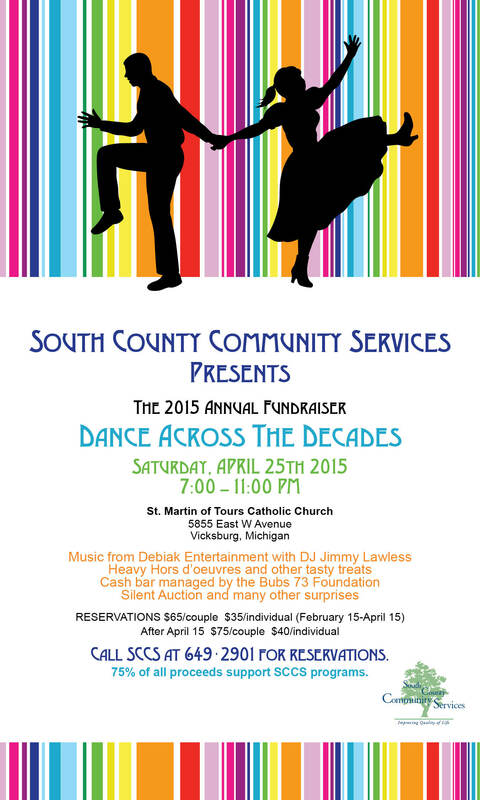 Dance Across the Decades Coming Soon! 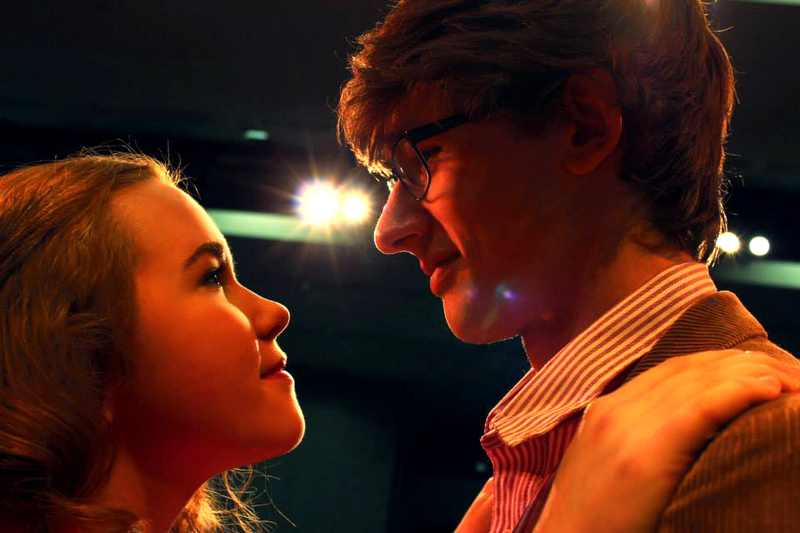 Kristin Gustavson (as Elle Woods) and her co-star Cassidy O’Brien (Emmett Forrest), in the Vicksburg High School musical, LEGALLY BLONDE. Photo by Mekena Seaver. There’s more than meets the eyeliner in Legally Blonde, the Vicksburg High School spring musical opening Friday, March 13. It’s a spunky, heartwarming morality play about sorority president Elle Woods who overcomes stereotypes and scandal to discover her own self-worth and true love. The show opens at 7:30 p.m. on the 13th, and at the same hour on March 14 and 21, closing on Sunday, March 22 with a 2 p.m. matinee. Fresh from the Kalamazoo Civic’s Shrek, The Musical as teen Fiona, sophomore Kristin Gustavson inhabits Elle brilliantly with Bruiser, the ever-present pooch crooked in her arm. It’s a far-cry from being the Dragon in VHS’s 2014 production of Shrek, but another showcase for Gustavson’s diversity as an actress. Legally Blonde sings and dances its way through Elle’s transformation from heartbroken airhead to Harvard Law School valedictorian. Her evolution gives the story its substance. From arm-candy to the snobby BMOC, Warner Huntington III (a suave Seamus Hyman adds polish here) to real love with the sensitive, down-to-earth Emmett Forrest (delivered in an intelligent and authentic performance by junior Cassidy O’Brien), this brains-over-beauty comedy is based on a 2001 award-winning comedy originally starring Reese Witherspoon. 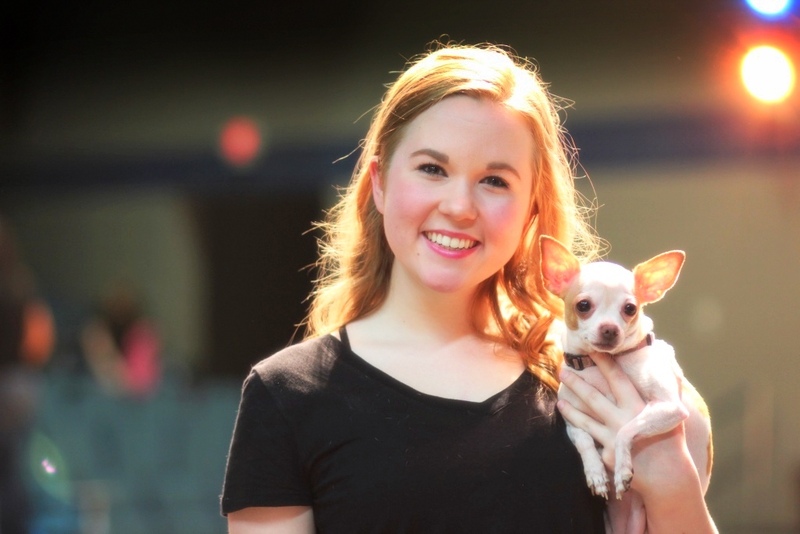 Kristin Gustavson and Bruiser the chihuahua star in LEGALLY BLONDE The Musical at Vicksburg High School. Photo by Mekana Seaver. Legally Blonde features a line-up of memorable tunes musically directed by Dustin Morris; high-energy choreography of Melissa Sparks; sets designed by Tim Fuller; and a colorwheel of costumes created by Susan “Mama-Lein” Leininger. A large, enthusiastic student cast of characters includes Paulette the hairdresser (beautifully styled by senior Amanda Wilson); the pompous Professor Callahan (portrayed with attitude by Alex Cannizzaro); and the very fit, fan-devoted Brooke Wyndham (executed flawlessly by Michaela Oesterle). Tickets are on sale now at the Vicksburg Performing Arts Center on-line at https://www.centerstageticketing.com/sites/vicksburg/ or by calling 269-321-1193. This is a photo, circa 1916, of “The Commercial House” in downtown Schoolcraft. It was headquarters for Kalamazoo County State Bank, which moved to the west side of Grand Street on April 2, 1940. 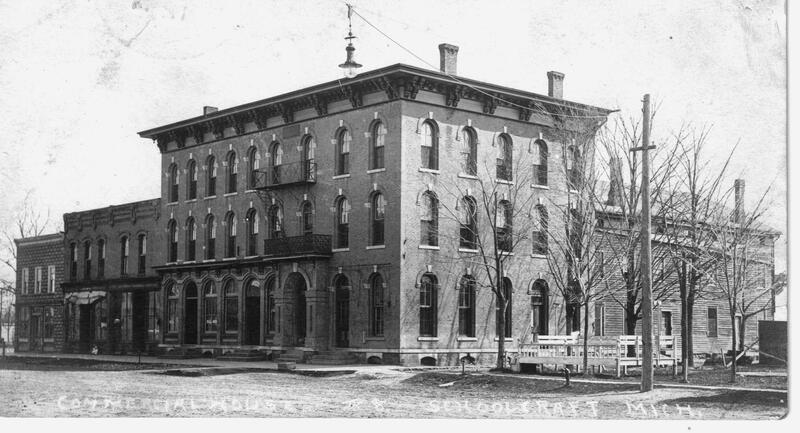 This great old building still stands and now houses Bud’s Bar. In looking closely, you will notice the original building had three floors, whereas the current building has only two. Old timers in Schoolcraft have been queried as to when the third floor was removed and why. Some have said it was unsafe, others thought there was a fire in that area. If you have further information about what happened, Kim Maxam who supplied this photo from the archives of the Schoolcraft Historical Society would be interested in knowing. Her email address is maxamka@yahoo.com. If you have an old photo you would like to share, please email it to Steve Ellis at steve@swmspark.com and we will consider it for future issues and/or our Facebook page. 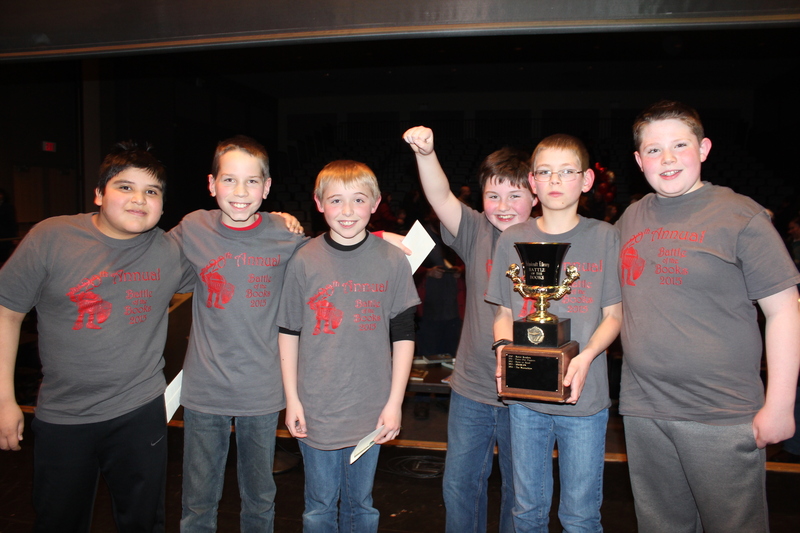 The Question Marks?, winners of the Battle of the Books are, from left, Dylan Ortiz, Bryce Kucz, Caleb Bushong, Ian Walraven, Justin Peter, and Alex Emery. 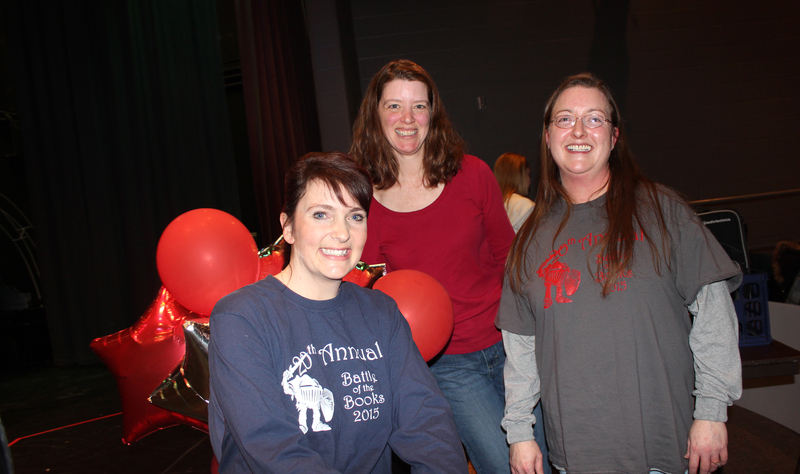 The fierce Battle of the Books, sponsored by Schoolcraft Library, was won by a team from Tobey Elementary called The Question Marks?—and yes, that question mark is a part of the name. At the first 32-team round of competition, the team scored perfectly. In the second championship round it was nearly perfect to win outright at the February event. Three other teams from Sunset Lake Elementary, Parchment North Elementary and Schoolcraft Elementary/MS team, which took second place overall, competed for the Grand Battle. Coaches for the Question Marks? were moms Christie Walraven and Brenda Peter. This was the team’s second appearance in the Battle which built on their experience and resolve to win, according to Walraven. “The boys worked well together, beginning Nov. 1, 2014 and never let up,” she said. Teams were required to read 12 books of different difficulty and interest. They had to understand what the author had to say, memorize some things in the book, then answer questions composed by Jenny Taylor, who took long-time librarian Bobbi Truesdell’s place as the questioner. Taylor, a third grade teacher from Vicksburg’s Sunset Elementary, said, “My biggest challenge was seeing children have hurt feelings on Saturday when they went home. What I want them all to remember is that they are all winners for doing this program. They read amazing books with challenging content and details. They met with teams regularly and were accountable to their teammates and coaches. These dedicated coaches standing in back of the moderator Jenny Taylor, for the Question Marks? are Brenda Peter and Christie Walraven. The Schoolcraft Library staff coordinated the event, which was celebrating its 20th year anniversary of serving young people in the Vicksburg, Parchment, and Schoolcraft schools. Faye VanRavenswaay, the new head librarian in Schoolcraft, said she was “grateful the library has Jenny on board with us for our 20th year. Jenny was just a delight to work with and we both felt that we made a great team—with Jenny writing questions and moderating, and me coordinating and organizing the event, we were able to pull it off utilizing our strengths. It kind of felt like we were a tag team on Battle day. I introduced each battle, Jenny asked the questions, and we conferred on challenges and other questions. John Thomas playing his Gibson guitar. Schoolcraft Library will host a talk by John Thomas, March 20th at 2 p.m., the public is encouraged to attend. 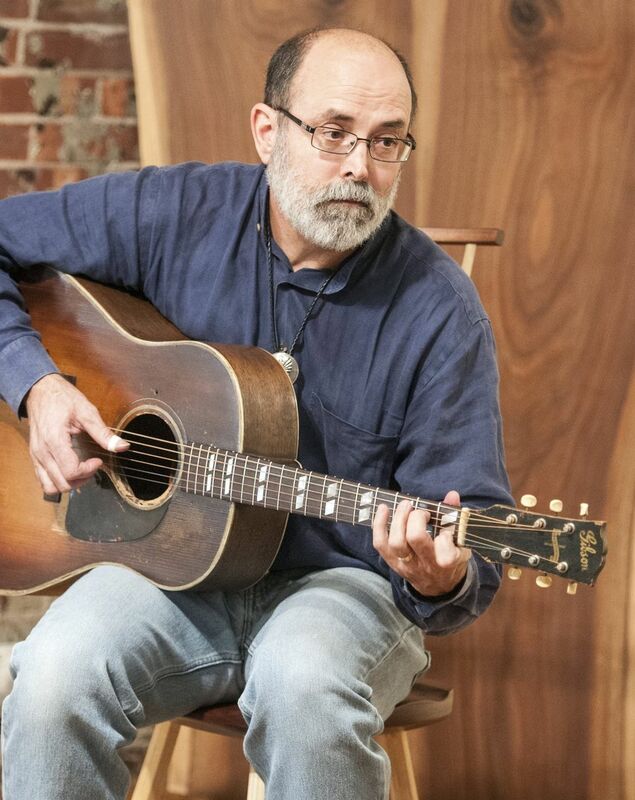 He will have a multimedia presentation on “Kalamazoo Gals”, a book he has written, including x-rays of gal-built Gibson guitars and he will bring a gal-built guitar that he may play a few tunes on. The mother of one of the library’s patrons is in the “secret” photo of the ladies posing in front of the factory- she pointed it out at the last Adult book discussion meeting, which makes it even more exciting to have him appear. The library also has a project going on called “Warm Up South County” which will have a day for assembling blankets in March. They are inviting people who crochet or knit to donate squares to be assembled into blankets for South County Community Center to disperse- primarily to seniors. People were to bring in their squares by February 21st and then help assemble on three days later but bad weather cancelled the work session. Patrons of the library can help to chase away the winter blues at its first ever Prairie Page Turners Multimedia Art Open House and exhibit. On March 11 from 5 – 7 p.m., visitors are invited to meet ten talented local artists and view their fantastic creations including pastel arts, crochet, knit, cross stitch, quilting, 3D paper collage, and Raggedy Ann dolls. Also on display, a fabulous collection of Barbie dolls. Refreshments will be served. The exxhibit runs through April 24th. The next Osher Life Long Learning (OLLI) program begins on March 24 and picks up one more session on the 31st. Local historians Harriett Swartz, Nancy Rafferty, Don Sanborn, and Kim Maxam will be the presenters on the early history of Schoolcraft, entitled “Little Boston of the West.” Registration for the course is through WMU’s Extended University Programs and will be held at the Schoolcraft Library. In April, Korina Thompson will present Cupcakes Dreams Come True, through the OLLI program. It will take place at her business The Salted Cupcake, on Grand Street in Schoolcraft. This class had a limit on participants, but it wouldn’t hurt to check and see if it is full. Call Joyce Dekau at 387-4200 for more information. Working at the collection station to unload and load newspapers are from left to right, Joe Fisher, Chris Goodwin, Fisher Wilson, Nadga Campbell, and Kyle Campbell. The Vicksburg Boy Scouts from Troop 251 have been collecting old newspapers since the late 1950s as a fundraiser for their activities and a community service. The collection effort has fallen on hard times, due to the discontinuance of some editions of the daily Kalamazoo Gazette according to Nadga Campbell, the scouts’ collection coordinator. The move to people reading on their computers or cell phones has also impacted their revenue, she says. Thus the troop has reduced hours of operation from every week, to twice a month and recently to once a month. 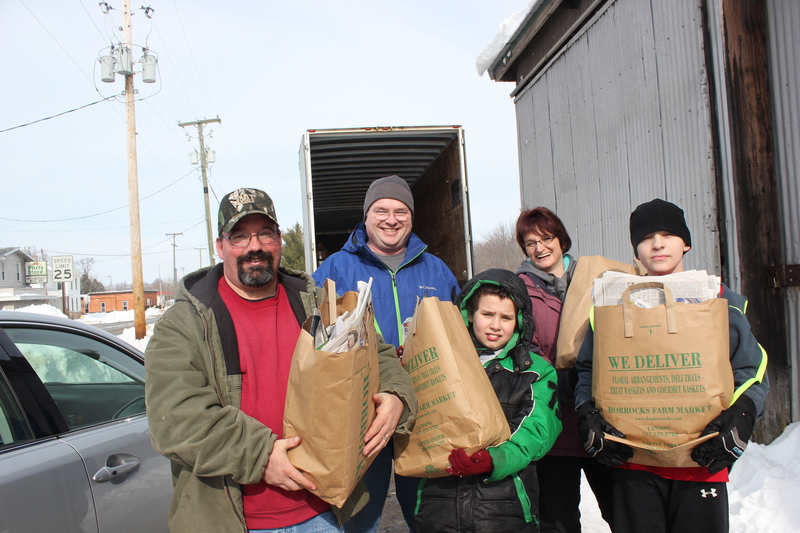 The collection is now on the first Saturday of the month from 9 a.m. to 1 p.m. The demand for scrap newspaper has also fluctuated with the times. Currently Graphic Packaging delivers a trailer each month to the collection site on N. Richardson Street and picks it up, dumps the contents onto its ramp and processes it for making paperboard. The 40 young people who are currently participating in Troop 251 are broken down into four smaller groups, patrols. The patrol leaders are responsible for organizing their patrol to work a shift schedule with four boys per shift and two adult leaders. Each patrol works three times a year, lifting donors’ papers into the large trailer—which many of them can barely reach or even see over the open end. They will rush to help people unload their cars or trucks, all the while thanking each donor. “The total amount of money raised in 2014 was $1,477.50 for 53.32 tons of paper,” according to Campbell. The distribution of funds is 50 percent to the scouts’ patrol in attendance on any given Saturday, 45 percent to the troop’s general fund. Five percent goes into a relief fund that helps underwrite some individual scouts who might not be able to afford to stay in scouting with funds for uniforms, registration, and troop activities. Campbell laments the drop off in collections, but believes it is still important as a service to the community. In fact, each month, a scout parent will drive to Kline’s Resort to pick up newspapers that are gathered by the residents there, so they don’t have to drive into town. The scouts have also started to collect returnable cans and bottles as well as the tabs off the cans at the paper barn on N. Richardson Street, Vicksburg. “It’s just another way we can help recycle within our community,” Campbell says.